Ahead of Northwest zonal Delegate convention of People’s Democratic Party (PDP) this Saturday, newly elected executives, has been sworn in with former Aviation Minister (State), Felix Hassan Hyet emerging as consensus chairman after the just concluded state congress. The newly elected state Chairman, in his inaugural speech shortly after the swearing in Kaduna on Friday, was optimistic that the party would reclaim power from ruling All Progressives Congress (APC) come 2019. Hon. Hyet said that this is because the ruling APC, has failed in all its campaign promises, leaving the people in abject regret, poverty and starvation. He said the PDP will work for the enhancement of Nigerians as well as the country if reelected in 2019. “PDP government for 16 years did not fail to pay workers salaries but the APC for just a year is indebted to workers for 8 months. “I’m appealing to our members to eschew bitterness, embrace each other, forgive themselves and join hands with the party to work for the people. “We should be a united family and as you have elected us, we shall ensure equity to all as according to our vow. 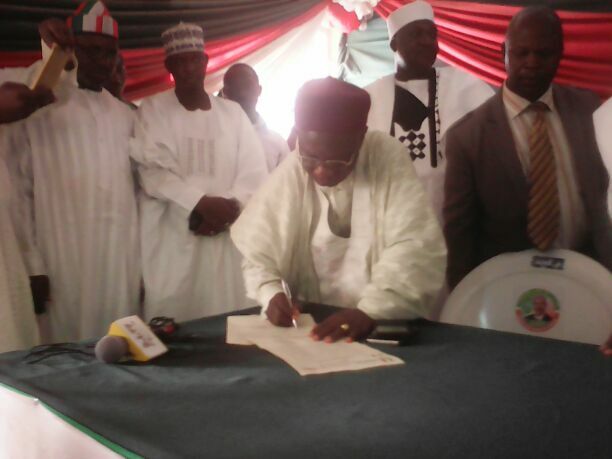 “The PDP will go down to the local governments as a starting point for its resuscitation,” the new chairman assured.